I started learning French about ten months ago. It was an idea that I toyed with for the ridiculously large span of one to thirteen years prior (when it was offered in middle school and my dearest mother thought Spanish would prove more useful in my future and made me study it instead – I will neither agree or disagree with that point all of these years later). Initially this venture, ten months ago, started out of spite – I was surrounded by French speakers and could never get a word in edgewise because I never knew what the hell they were talking about. I planned to learn it the best I could, without telling them of course, and then shock everyone when I was well-versed enough to call them out on their merde. I relate to this look all too well. 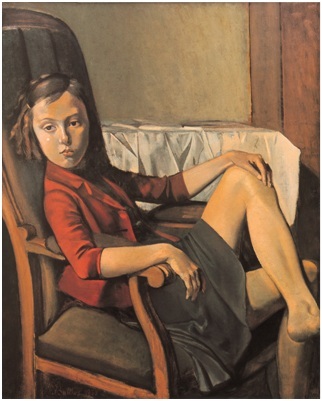 Balthus (Balthazar Klossowski), Thérèse, 1938. Oil on cardboard mounted on wood, 100.3 x 81.3 cm. The Metropolitan Museum of Art, New York. Needless to say that never happened as one cannot learn a language in ten months without actually eating, sleeping, and breathing it (I have a life, after all). I do listen harder and repeat phrases in my head. I bother French speakers with inane grammatical and pronunciation questions. Sometimes immature young men will teach me a phrase or two and send me off to repeat it to another immature guy and they’ll all have a giggle at my expense, leaving me supremely embarrassed, but equally proud of my ability to mimic. 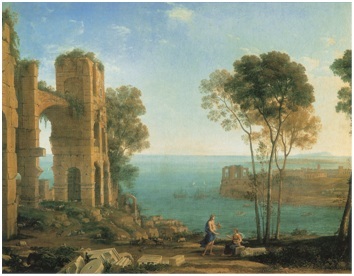 Claude Gellee (Le Lorrain), Coast View with Apollo and the Cumaean Sibyl, 1645-1649. Oil on canvas, 99.5 x 127 сm. Collection of Sir Robert Walpole, The State Heritage Museum, St Petersburg. For the longest time I never had a single nice thing to say about anything French – except maybe Amélie, but that doesn’t really count considering its international notoriety. I don’t care for frog’s legs, snail, or duck confit; I don’t really enjoy Impressionism, mostly because endlessly repeated titles make fact-checking a nightmare; call me Guy de Maupassant when it comes to the Eiffel Tower (fun fact: Maupassant ate at the Tower’s base daily because he hated it so and that was the only place in the city that he was unable to see it); do not get me started on roquefort, maroilles, or epoisses (ugh, ick, bleh). 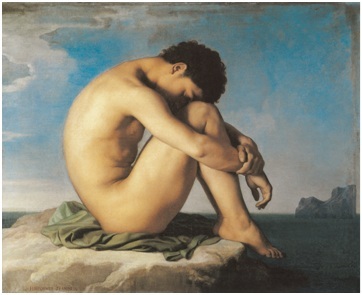 Hippolyte Flandrin, Young Man Sitting by the Sea, figure study, 1836. Oil on canvas, 98 x 124 cm. Thankfully now, I could probably rustle up a few nice things to say – the politeness of gentlemen, Realist and Romantic paintings, the frankness of women, the invention of the guillotine, etc. I am most especially in awe of the vast collection of art housed in France and could probably spend one week in the Musée du Louvre and neither see enough or tire of it. Since most of us don’t have the time, money, language skills, or (if you’re like me) patience to endure France, visit the National Gallery of Art, Washington to see Color, Line, Light: French Drawings, Watercolors, and Pastels from Delacroix to Signac from 27 January to 26 May. It promises a beautiful array of French art. Don’t want to travel too far from home? Check out French Painting by Victoria Charles for all of the artistic glamour without the offensive cheeses. Our cheeses we are proud, our wines too ! We have some good reasons to be proud, yes. But we are wrong, because we believe that we are alone in the world. Yet the world produces, the world built, other countries make cheeses, wines, and so one. There is not that Le Lorrain, Boucher Fragonnard, Delacroix. Flandrin and Monnet. Rembrandt, Goya, Boticelli, Hopper, Yun Shouping are important. Greatest ?. Maybe. Yes, without a doubt, if you want ! Thanks for your blog. I like it. JM, You will have to forgive my extended delay of response. Please understand that I actually have no ill-feeling towards anything French except most cheeses, animals intended for food, and Impressionism (as previously listed above). I do worry how I would fare were I to visit France, mostly considering how little French I can successfully speak, but that would not stop me from visiting the masterpieces in Rouen, Nantes, Rennes, etc. I have a feeling that the French and Americans, though neither of us will acknowledge it without reluctance, have a lot more in common that we’re willing to admit: disliked by many, understood by few, and all for the wrong reasons. Worry not, though; while I cannot help my faith in frank Frenchwomen, brutal honesty at its best and after my own heart, I have little actual faith in the politeness of French-gentlemen. Thanks for one’s marvelous posting! I really enjoyed reading it, you are a great author.